In a house teeming with life, young Maura, voted the Most Quiet Girl in Catholic school, notices everything but says little. Eager to penetrate the secret world of her father, FBI agent Joe Conlon, she is drawn to the bureau drawer where he places his badge at night. The time is the late 1960s, and Vietnam and the Cold War are fomenting unrest outside Maura's suburban Los Angeles home. Inside, the Conlons and their five children are still bound by tradition: baseball games, Sunday dinners of roast beef and mashed potatoes, and The FBI on TV. Under the watchful gaze of J. Edgar Hoover's picture, Maura's mother, a former New York bathing beauty, remains a housemaker even as she slips out for assertiveness training. And there's the one unshakable rule of all: Joe Conlon never talks about his job. In fact, he rarely speaks at all. Believing that he communicates in code, Maura is determined to crack it. She uses clues gleaned from Nancy Drew mysteries, eavesdrops on adult conversations, and spins larger-than-life fantasies in her head, with her younger brother, Joey, who has Down syndrome, at her side. But her flights of fancy turn sober with a murder in the family. Suddenly her father's silence speaks volumes, and she learns a lesson from him abut fierce love during a time of devastating loss. Bathed in luminous nostalgia, resonating with hilarious and painful memories, FBI Girl is the coming-of-age story of a highly imaginative girl and a passionate homage to family bonds, the trials that test them, and the triumphs that make them stronger. What did you love best about FBI Girl? Maura Conlon-McIvor's story of growing up in a Catholic, Irish-American family is personal and delightful. 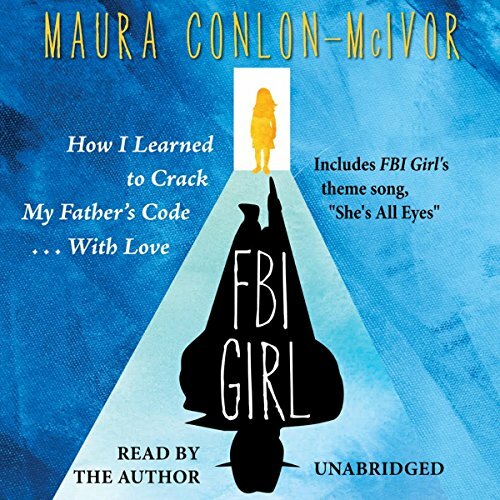 Her yearning to understand and be close to her reticent FBI agent father by creatively trying to crack his code by becoming an FBI girl-in-training is a fun read. Her parents love, their demonstrable loving support of her brother with Downs Syndrome and a devastating murder in the family make this a story of growing up and a shaping of her character and the person she is to become. Maura's personal narration of her book adds to the books enjoyment and her ability to draw you into her story is outstanding.